We’d heard rumor that rice was being grown successfully in New England, and went on alert when we spotted it on the menu at T.J. Buckley’s while passing through Brattleboro a few years back. After a sumptuous dinner skillfully prepared from local ingredients, we had the chance to speak with chef-owner Michael Fuller. He told us that the rice was from Akaogi Farm, and that if we were still in town, we’d be able to find them at the Brattleboro Farmers’ Market. It was our chance meeting there with Linda Akaogi that launched our interest in growing this semi-aquatic annual ourselves. 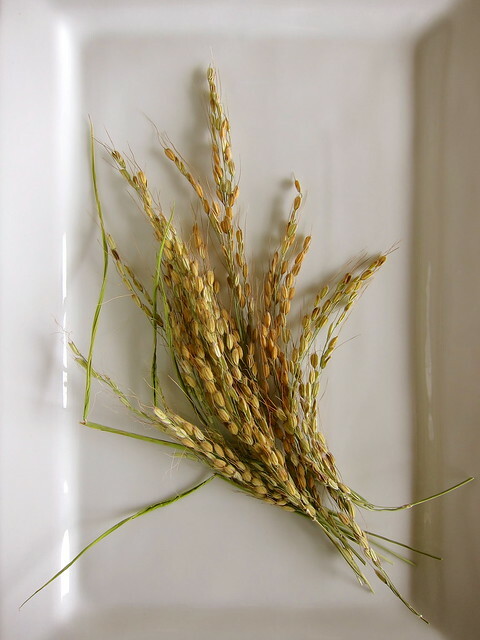 Following Logsdon’s observation on growing rice in northern climes, the Akaogi’s began experimenting with a short-grain rice from Hokkaido. To accommodate this grain’s need for water, they built up a model system of paddies that’s the focus of a series of annual conferences held there. As a way of duplicating this condition at home, we planned to grow rice in buckets. 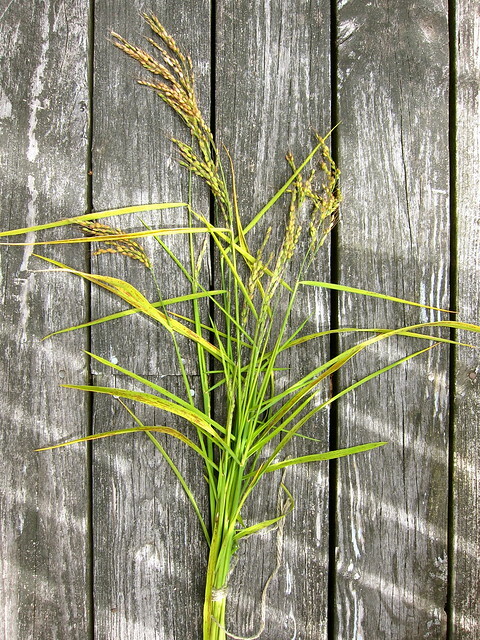 After some research, however, we read about Roberta Bailey’s experience with growing Duborskian Rice (Oryza sativa) in Maine, and how this upland variety offered a more manageable approach than paddy rice in that it doesn’t require flooding in order to grow. Even more compelling, the resulting grains were being offered through Fedco Seeds, which would ensure a head start on adapting to local conditions. 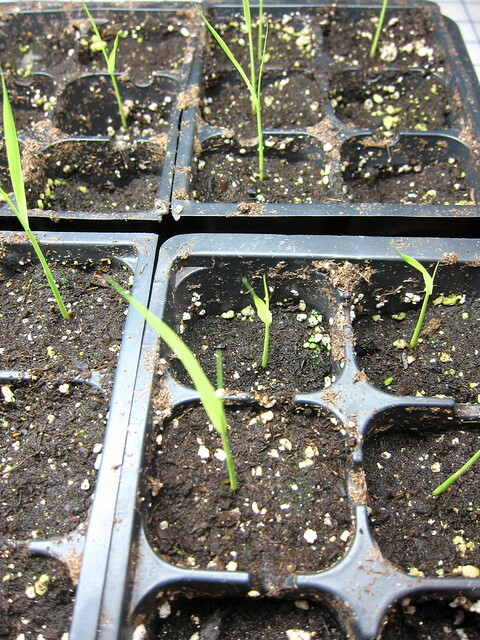 Mid-May (above): Seedlings started indoors under lights, and beginning to form first leaves. 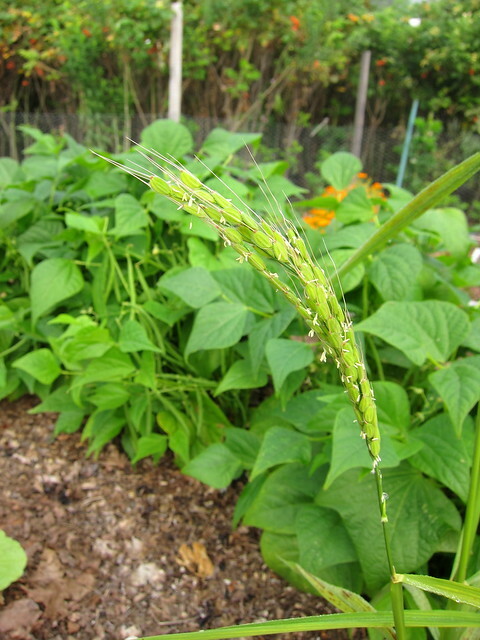 Rice can be direct seeded, especially in warmer climes, or transplanted. Our first year’s batch failed soon after transplanting, and we learned to plant only one seed per plug to lessen the shock. Though we didn’t pretreat, it’s recommended that they be soaked for 12 to 24 hours before planting, and started 4 to 5 weeks before transplanting into warm soil, which, here in Maine, isn’t until early June. According to Sara Pitzer in Home Grown Whole Grains, rice needs at least 40 continuous days with temperatures above 70°F, a challenge in our short season. Mid-August (above): With a little experience, our second attempt last year brought us better luck. Out of the 9 seedlings transplanted, 3 survived, and two of them long enough to set multiple stems called tillers, each destined to produce a seed head, or panicle. Though Duborskian is referred to as a dry-land rice, it still needs constant moisture and plenty of it, which we helped along with a thick layer of mulch. End of August (above): The panicle towards the end of flowering, with some stamens still attached. 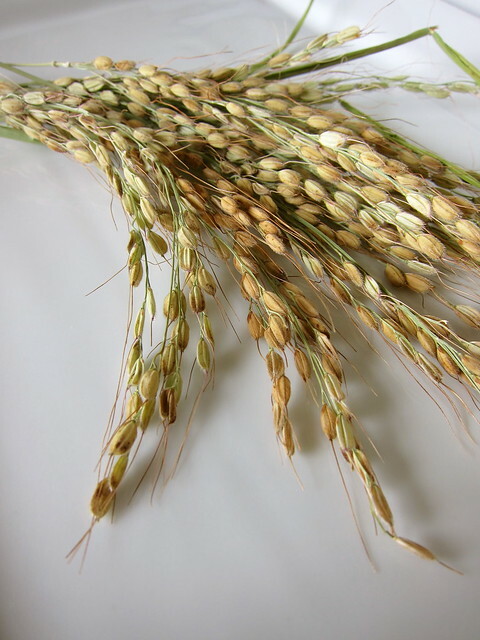 As the rice plant flowers and sets seed, this is especially the time to ensure the plant has enough moisture to keep its energy up. Early September (above): Though it may have been little more than watching grass grow, we are ridiculously excited to finally have something recognizable as rice. Seeing these seed heads nodding as they mature made the entire effort worthwhile. Early October (above): By the first week of October, we harvested the rice by clipping the tillers and hung them to finish drying. 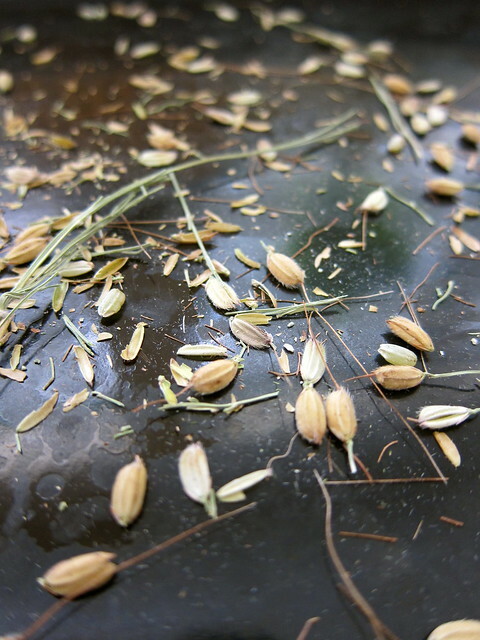 On further reading, we found that rice is ready to harvest when the seed heads look brownish gold and look heavy. These probably should have been left longer before harvesting, and, though they can tolerate a light frost, we’d didn’t want to run the risk of having them rot on the plant. Upland rice may not be as productive as paddy varieties, each plant can average up to as much as 18 tillers each, and our two rice plants produced over a dozen tillers total. After drying, the grains are separated out, usually through threshing and winnowing to produce what is known as rough rice. At this point, the rice is still encased in a hull, and can be saved as seed for 10 years. Next to growing it in the first place, the biggest obstacle to home growers is extricating the rice from its notably tough hull. Unless you have access to a mechanical huller, one of the traditional methods is to pound the grain with a mallett. We opted for a more domestic approach by baking the rice for 1 hour at 180°F, letting it cool, then rubbing the hulls off each individual grain. Hulling rice by hand is a painstaking process, for sure. One tiller produced about a half teaspoon’s worth of grain (above), and gives new meaning to the phrase “every grain of rice,” of which we’ll never think of quite the same again. It’s not enough to make a meal, however, it’s given us a more intimate understanding of what it may take to produce it locally. With last season’s success, we now leave growing it to our local farmers, such as our friends at Stout Oak Farm who have plans this coming season to grow out several varieties of rice, including Duborskian, as part of a regional effort to increase and expand the supply of available seed. 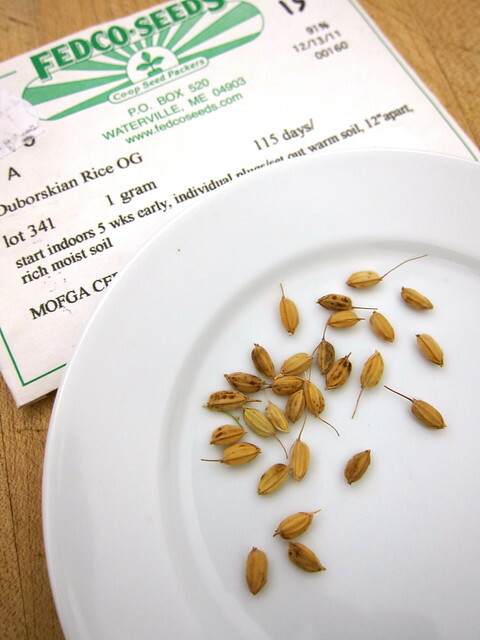 • Fedco Seeds: Duborskian Rice — Organic seed grown in Central Maine; 115 days from transplanting. 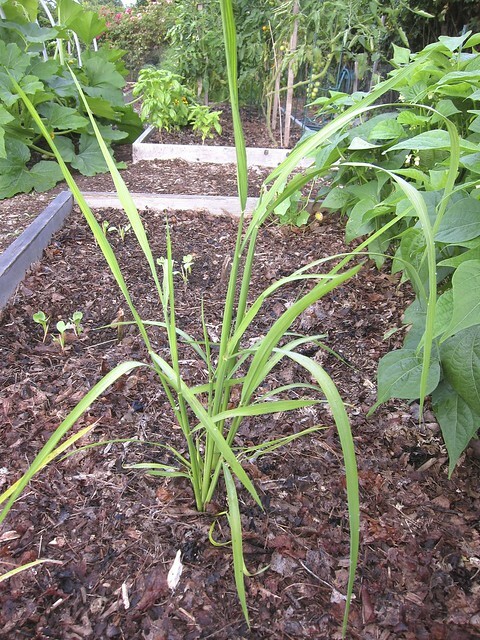 • Sherck’s Heirloom Vegetables, Plants & Seeds: Duborskian Rice — Seed from Northern Indiana, includes link on growing it out. • Kitazawa Seed Co.: Koshihikari Rice — May be also grown as an ornamental; 128 days. • Ecological Rice Farming in the Northeastern USA, Cornell — Collaboration between Akaogi Farm and Cornell to support small-scale rice growing in the Northeast; annual summer conference. 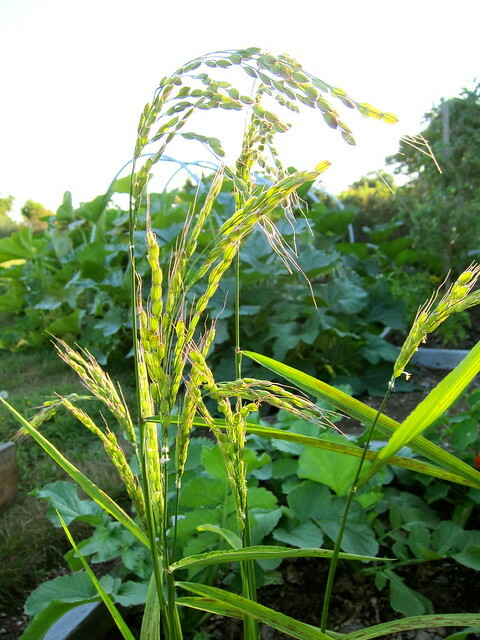 • Harvest Kitchen: Growing Rice in Central Maine, MOFGA — Roberta Bailey’s account of growing Duborskian rice from seed sourced from Seed Savers Exchange. • Homegrown Whole Grains by Sara Pitzer — Accessible information on growing rice and other grains for the home gardener, plus instructions for growing rice in a bucket. 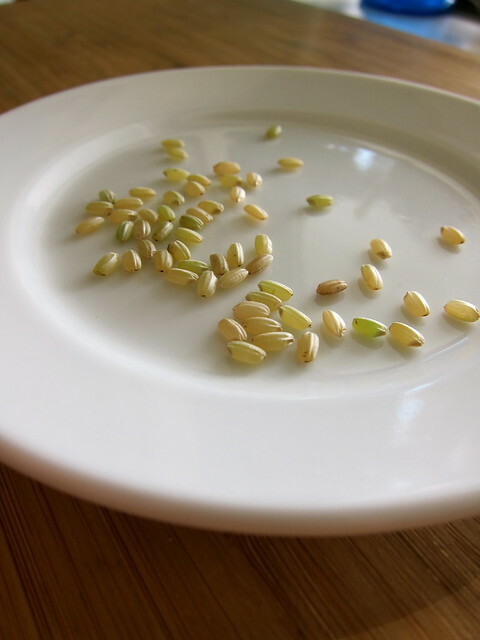 • Small-Scale Grain Raising by Gene Logsdon — More in-depth information on growing rice and other “pancake” grains for the small-scale grower. This entry was posted in garden and tagged grains, local, rice. Bookmark the permalink. EEeeeeeeeeeeeeee!!! I-am-soooo-excited to hear this!!! Shall I inquire with Kate about help with $ backing?! Kickstarter!!!!! 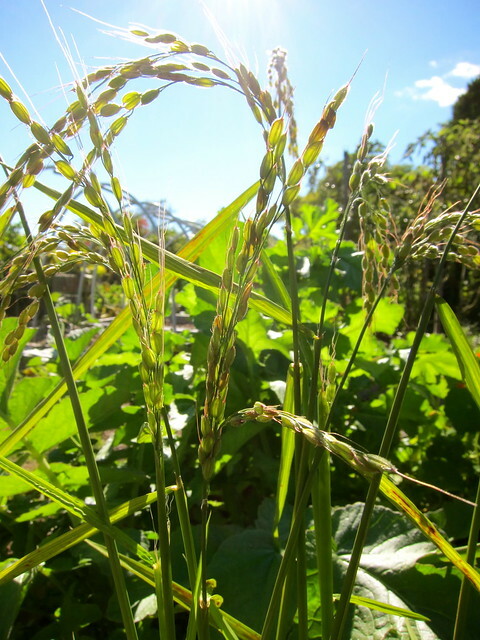 Congratulations on your rice growing success, so exciting! May not be enough for a meal but you could use it as one of the ingredients in a pot of soup. My goodness, homegrown rice in MAINE! Amazing. Congratulations in yet another adventure in locally sourced food well done. We’re not sure we grew enough to count as food, but it did show that it’s possible! It must have been a lot of fun to watch the grass grow, truly. And it was a valuable lesson about how precious such hard wrought harvests are. I imagine the local grown rice is expensive, but easier to spend the $$ on now that you’ve tried growing it yourself. It was so much fun, We’re tempted to try it again, but this time in buckets! Excellent, the more I read about rice growing in New England, the more I am encouraged. I have started this year. Got about 25 kernels. Sown four in water laden soup cup and four in a drenched kitchen towel. It is the 3rd day today. They are under two CFL lamps . The lamps are switched on for about 4 hours a day. I do have my beets and red beans sprouting in a ziploc bag as said for the rice above. Have to try that for rice as well.